robin hood was here: Where did Robin Hood spend the Winter? Where did Robin Hood spend the Winter? Well probably not in the heart of Sherwood Forest! Not only would it be rather cold and short on food, but the route known as the King’s Great Way would also have been relatively low on rich travellers during those months when snow, sludge and ice made the passage more arduous. Robin Hood’s so called “Merry Men” were effectively a medieval gang, and popular gangs operate by providing in some small measure for the needs of the community which harbours them (albeit often illegal). Therefore, by stealing from the rich and giving some handouts to the poor, they could have gained both warm shelter and anonymity in the local villages of Blidworth, Papplewick, and Byrunsdale (called Bernysdale in the old tales, now known as Old Basford), during Winter. 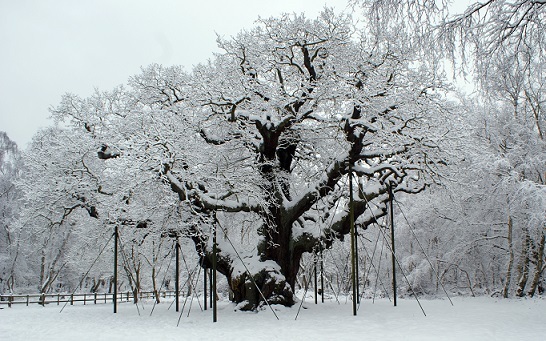 Video shows Sherwood Forest covered in a blanket of snow, January 2013, featuring Robin Hood's tree the Major Oak. Many thanks to the Sherwood Forest Visitor Centre groundstaff for allowing me access to the statues when the centre was closed. Above: The Major Oak, Robin Hood.s Tree, Winter 2012.